Postprocessing rendered pixels. To create effects such as color grading and displacement mapping, define techniques that use as input the color buffer rendered by SceneKit and process that buffer with a fragment shader. Deferred shading. To create effects such as motion blur and screen-space ambient occlusion (SSAO), define techniques that capture information about the scene into an intermediary buffer during the main rendering pass and then perform additional drawing passes using that buffer to create the final output image. The figure below illustrates the rendering process for an SSAO technique. To create an SCNTechnique object, you supply a technique definition that specifies the input and output image buffers, shader programs, shader input variables, and rendering options for each drawing pass in the technique. Defining a technique does not require Metal or OpenGL client code, but you should be familiar with the terminology and conventions of GPU rendering. To use a technique, assign it to the technique property of a view (or other SceneKit renderer object) or a camera. SceneKit treats rendering techniques—along with shaders, 3D models, and 2D art assets—as resources rather than as part of your application code. Because the effects you create with techniques are highly visual, this approach allows you to separate design efforts from development efforts and quickly iterate on creating the visual content of your app or game. Create a technique object using the init(dictionary:) method, providing a dictionary that defines the technique as a series of drawing passes, each with its own shader program, inputs and outputs, and rendering options. Typically, you obtain this dictionary from a property list file included in your app’s bundle resources. Table 1 and the additional tables and sections that follow specify the format of this dictionary’s contents. A dictionary of drawing pass definitions. Each key is a unique string you provide to identify the pass, and the corresponding value is a dictionary defining that drawing pass. See Table 2. An array of strings, each of which names a drawing pass from the passes dictionary. SceneKit performs the drawing passes in the order specified by this array. A dictionary defining the bindings for GLSL attributes and uniform variables used in the technique’s shader programs. Each key matches the name of a symbol used in the shader source code, and the corresponding value is a dictionary describing how that symbol should be used. See Table 4. A dictionary defining intermediary rendering targets. Each key is a unique string you provide to identify the target (used in the inputs and outputs dictionaries of a drawing pass definition), and the corresponding value is a dictionary defining the rendering target. See Table 5. DRAW_SCENE: Render the entire scene. DRAW_NODE: Render only the node specified by the node key (and its hierarchy of child nodes). DRAW_QUAD: Render only a rectangle covering the entire bounds of the view. Use this option for drawing passes that process image buffers output by earlier passes. The GLSL shader program to use for the drawing pass. Shader source code files in the app’s bundle resources directory must have the same base name and the extensions .vsh (vertex shader) and .fsh (fragment shader). For example, if the program name is “invert”, the files “invert.fsh” and “invert.vsh” must exist. The names of the Metal vertex and fragment shader functions to use for the drawing pass. These functions must exist in the app’s default Metal library. You must specify both fragment and vertex shaders, and you must specify either a GLSL shader program, a pair of Metal functions, or both. If both are specified, SceneKit uses whichever shader is appropriate for the current renderer. Definitions of input variables for the drawing pass. Definitions of output image buffers for the drawing pass. Each key is one of the strings color, depth, or stencil, and the corresponding value is a string identifying a render target. See Render Targets, Inputs and Outputs. The name property of the node to render, or self to reference the node the technique is attached to. Applies only if the draw key specifies DRAW_NODE. clear (Boolean, defaults to false in macOS and true on iOS): Whether to clear the rendering target before drawing. If true, you must specify one of the clearColor and clearWithSceneBackgroundColor options. clearColor (string): The color to fill the render target with when clearing, specified in floating-point RGBA format. (For example, “0.5 0.5 0.5 1.0” is a fully opaque gray color.) Alternatively, the string sceneBackground specifies to use the scene’s background property when clearing. clear (Boolean, default false): Whether to clear the depth buffer before drawing. enableWrite (Boolean, default true): Whether to write to the depth buffer when drawing. enableRead (Boolean, default true): Whether to read from the depth buffer when drawing. func (string): The depth test function: never, always, equal, notEqual, less, lessEqual, greater, or greaterEqual. clear (Boolean, default false): Whether to clear the stencil buffer before drawing. enable (Boolean, default false): Whether the drawing pass should write to the stencil buffer. behavior: A dictionary specifying how to use the stencil buffer when rendering front faces (or both faces, if nothing is specified for the backFaceBehavior key). See Table 3.
backFaceBehavior: A dictionary specifying how to use the stencil buffer when rendering back faces. See Table 3.
back (default): Cull back faces, rendering front faces only. front: Cull front faces, rendering back faces only. none: Render both front- and back-facing polygons. enable (Boolean): Whether to use color blending. If false, the other blending options have no effect. colorSrc (string): The blend mode for source colors. colorDst (string): The blend mode for destination colors. alphaSrc (string): The blend mode for source alpha values. alphaDst (string): The blend mode for destination alpha values. colorOp (string): The blend operation for color components. alphaOp (string): The blend operation for alpha values. A custom viewport rectangle in view coordinates, formatted as four numbers (origin x, origin y, width, and height). By default, a drawing pass covers the entire bounds of the view. The name of a node in the scene to use as the viewer’s position for rendering; equivalent to the pointOfView property on a renderer. The number of samples per pixel for enabling multisampled rendering for the drawing pass. Defaults to 1. A bitfield used for including nodes in the drawing pass if the draw key specifies DRAW_SCENE or DRAW_NODE. Defaults to all bits set. See Category Masks. A bitfield used for excluding nodes from the drawing pass if the draw key specifies DRAW_SCENE or DRAW_NODE. Defaults to no bits set. See Category Masks. The stencil operation to use if the depth test fails: keep, zero, replace, increment, decrement, invert, incrementWrap, or decrementWrap. The stencil operation to use if the depth test succeeds and the stencil test fails: keep, zero, replace, increment, decrement, invert, incrementWrap, or decrementWrap. The stencil operation to use if the depth and stencil tests succeed: keep, zero, replace, increment, decrement, invert, incrementWrap, or decrementWrap. The stencil test function: never, always, equal, notEqual, less, lessEqual, greater, or greaterEqual. A bitmask for selecting the bit plane of the stencil buffer to be tested. A bitmask for selecting the bit plane of the stencil buffer to write to. The reference value for stencil tests. Defaults to 0. The values vertex, normal, color, and texcoord bind to geometry source semantics. See Geometry Semantic Identifiers. The values modelViewProjectionTransform, modelViewTransform, modelTransform, viewTransform, projectionTransform, normalTransform, modelViewProjectionInverseTransform, modelViewInverseTransform, modelInverseTransform, viewInverseTransform, projectionInverseTransform, and normalInverseTransform bind to rendering transformation matrices. See Rendering Transform Keys. The value time binds the system time elapsed since rendering began. If you set a semantic value for a symbol, no type value is required. The GLSL type of the input variable: float, vec2, vec3, vec4, mat4, int, ivec2, ivec3, ivec4, mat3, sampler2D, or none. Use this option when providing custom values to shader programs (see Handling Parameters for a Technique’s Shader Programs). If the symbol’s type is sampler2D, the name of an image file in the app’s bundle resources directory. When SceneKit performs a rendering pass whose draw option is DRAW_SCENE or DRAW_NODE, you can use category masks to filter the set of nodes drawn during that pass. For each node in the scene (or for DRAW_NODE, in the node subtree), SceneKit compares the node’s categoryBitMask property and the includeCategoryMask and excludeCategoryMask options in the pass definition using bitwise AND operations. If the node’s category mask and the include mask overlap (that is, the bitwise AND results in a nonzero value) and the node’s category mask and the exclude mask do not overlap, SceneKit includes the node in the drawing pass. Otherwise the node is not rendered in the pass. A drawing pass renders pixel data into one or more target image buffer (or framebuffer). 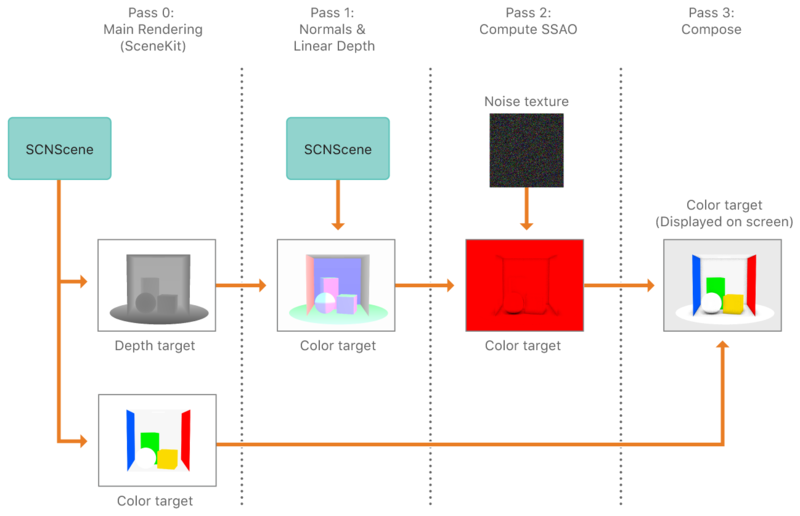 In SceneKit’s main drawing pass, the color render target is the screen (or rather, a view or layer for screen display), and a depth render target temporarily stores the information needed to ensure that rendered surfaces appear in the correct depth order. Use the COLOR and DEPTH targets as inputs to identify the color and depth buffers rendered to in SceneKit’s main drawing pass. Use the COLOR target as an output to identify the image buffer displayed as the end result of a technique. To create an intermediate target, define your own identifier as a key in the targets dictionary of a technique definition. For the corresponding value, provide a dictionary defining the render target using the keys and values in Table 5. Intermediate targets may be color, depth, or combined depth and stencil buffers. After you define a target, you can use its identifier in the inputs and outputs dictionaries of a pass definition. To use an image as an input texture for a pass, define a symbol of type sampler2D in the technique’s symbols dictionary. To specify a render target or image sampler in the inputs dictionary of a pass definition, you can provide either an identifier string or a dictionary with the format described in Table 6. The options for samplers correspond to similar properties for SceneKit material textures. For more details on each, see SCNMaterialProperty. The type of render target: color, depth, or stencil. The size of the render target image, in points, specified in a string of format “WxH”. For example, the string “320x480” specifies an image buffer 320 points wide by 480 points tall. The scale factor of the render target. Defaults to 1.0. For example, a value of 2.0 specifies 2 pixels per point, so a target whose size is “320x480” is 640 by 960 pixels. COLOR, DEPTH, a key from the technique’s targets dictionary, or a key from the technique’s symbols dictionary identifying a texture sampler. The blendStates key of a pass definition defines color blending options. Blending is disabled by default for faster rendering performance. Including a dictionary for this key enables blending (unless the dictionary’s enable key specifies false). Color blending combines a source color (the color output by the drawing pass’s shader program) with a destination color (the existing contents of the output buffer) using specified modes and operations. Available blend modes (for the colorSrc, colorDst, alphaSrc, and alphaDst keys): zero, one, srcColor, oneMinusSrcColor, srcAlpha, oneMinusSrcAlpha, dstColor, oneMinusDstColor, dstAlpha, oneMinusDstAlpha, constantColor, oneMinusConstantColor, constantAlpha, oneMinusConstantAlpha, and alphaSaturate. Available blend operations (for the colorOp and alphaOp keys): add, subtract, reverseSubtract, min, max. These values correspond to blending options defined by the OpenGL specification. For further details, consult the OpenGL API Registry or OpenGL ES API Registry. Listing 1 shows an example definition dictionary for a technique that uses displacement mapping with a noise texture to postprocess a rendered scene. For ease of reading, the dictionary is formatted in JSON syntax. (To load an NSDictionary object from text in this format, use the JSONSerialization class.) Listing 2 and Listing 3 show the GLSL source code for the technique’s vertex and fragment shaders. Creates a new rendering technique that combines a series of techniques. The dictionary defining the rendering technique. Specifies a block to be called before rendering using programs with the specified GLSL uniform variable or attribute name. Sets a value for the specified shader variable or attribute name, using subscript syntax. Returns the value associated with the specified GLSL uniform variable or attribute name, using subscript syntax.